Whether it’s because of government surveillance or cyberattacks, internet users are more concerned than ever about the privacy of their online activities. 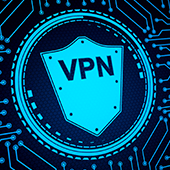 Unfortunately, security measures like firewalls and antivirus software can’t help you in this case, but there’s one that can: Virtual Private Network (VPN). Simply put, a VPN is a group of servers you connect to via the internet. Once you’ve established a connection, your computer acts as if it’s on the same local connection as the VPN, making it seem like you moved to a different location. When you surf the web through a VPN, all the data transmitted and received is also encrypted, preventing anyone -- from hackers to government agencies -- from monitoring your online activities. Of course, security and privacy are major reasons why you would want a VPN. For example, if you’re connected to a public WiFi network -- like the ones you typically see in local cafes and airports -- using a VPN encrypts the information you’re sending or accessing online. This means things like credit card details, login credentials, private conversations, or other sensitive documents can’t be intercepted by a third party. VPNs are also useful for accessing geo-restricted websites. If you’re traveling abroad and certain US websites are blocked in that region, you can simply connect to a VPN located in the US to access the sites you need. While free VPNs are available, we strongly suggest you avoid them. These keep logs of your internet activity, and in some cases sell them to the highest bidder. Maintaining a VPN service is also expensive, which means the free ones will likely plaster ads on your browser to make a quick buck. Paid VPNs like SurfEasy and StrongVPN often come with more robust features and configurations that keep you secure. What’s more, they don’t keep a record of the sites you visit and hound you with pop-ups that lead to dangerous websites. Finally, a great way to evaluate a VPN service is to sign up for their free trial service and visit https://ipleak.net/, which will allow you to check whether your real IP address is actually being leaked. If it manages to track your physical location, you need to opt for a more reliable VPN service.